Apartments up to 45 sq.m. 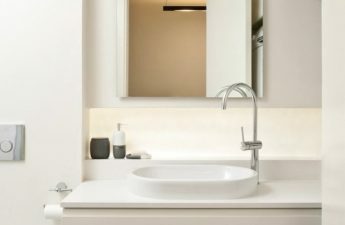 We meet a lot of information about the design of largeApartments and huge houses. But what if the real size of the home is far from desired? 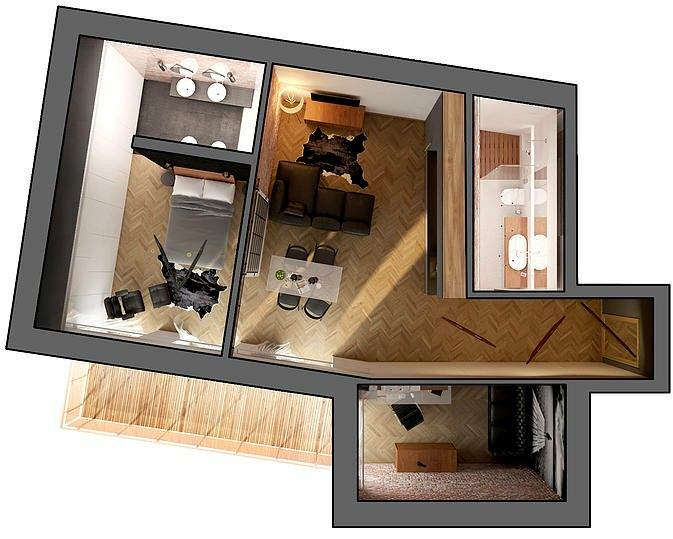 Reply to this question will help us an example of the design of an apartment of 22 square meters. 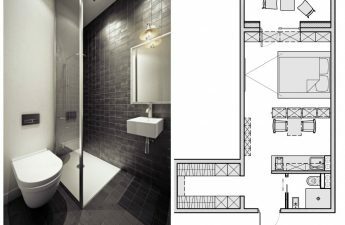 M. Here the main role played a departure from the stereotypes Today, with the example of a small apartment, we will tell you how a non-standard approach helps optimize space and adapt the tiny dimensions of an apartment to a comfortable life. 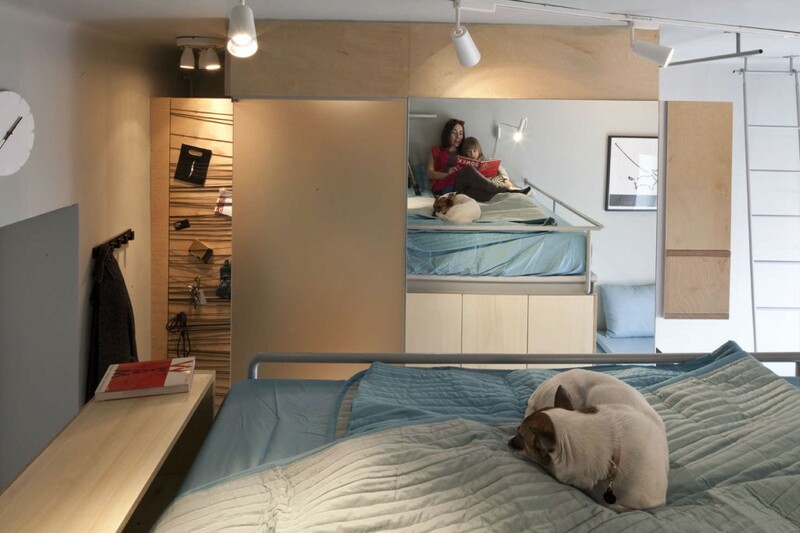 A competent layout and reasonable proportions of furniture allowed in this case to create a practical interior for a family of two people and a small dog. Interior Studio Utopia Studio (Warsaw, Poland)Proved in practice that does not mean uncomfortable. 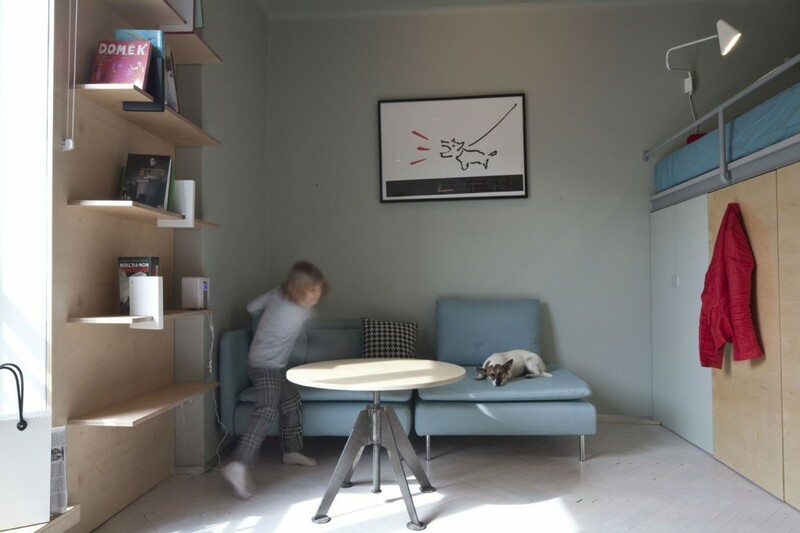 In the development of the studio team got an apartment intended for a family of mother and son and a mischievous dog. The main filling of the project was the functional furniture made to order from plywood and chipboard, which fully meets the limited area and budget. 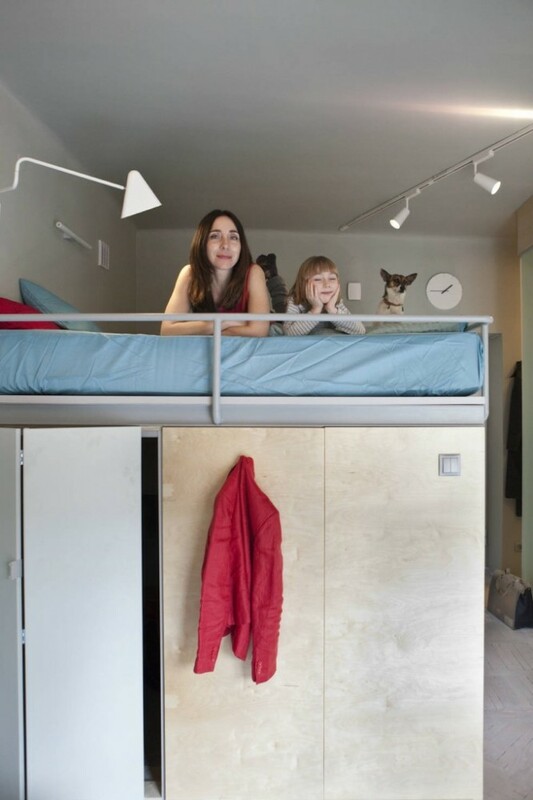 The authors of the project provided for a wardrobe and a wardrobe, built-in under the bed of the attic type. 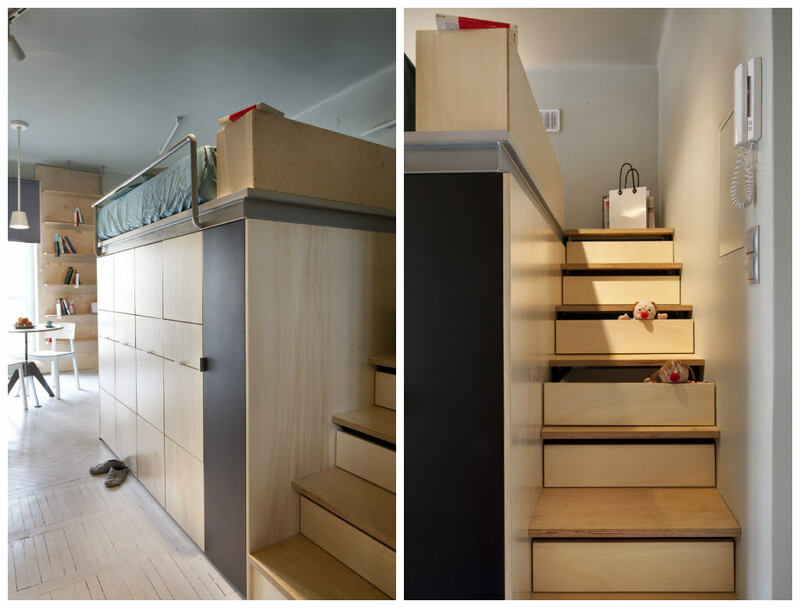 Even the steps of the stairs leading to the bed are equipped with drawers. The kitchen area, living room and dining area are combined into one, adjacent to a large panoramic window and look much more spacious than it really is. 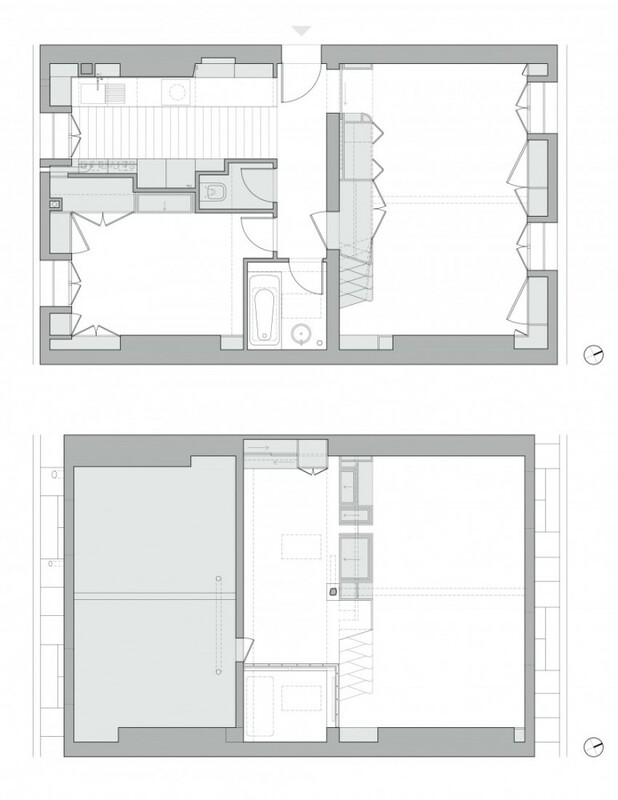 Color scale for small spaces The main scale of the apartment is gray-blue. 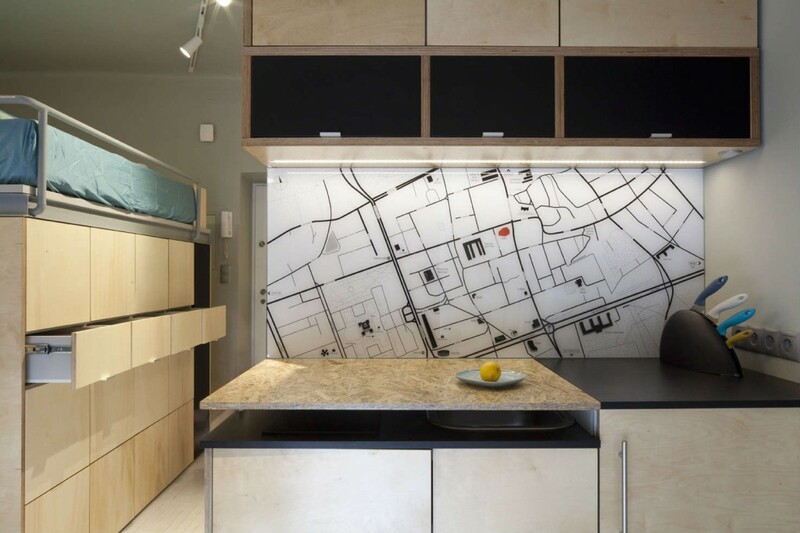 "Detaches" the vertical surfaces, the space of the apartment visually increases. However, the interior does not look gloomy due to the fact that the built-in furniture has kept the soft and warm tone of natural plywood. Classical parquet, painted in a white tone, is slightly aged, which gives the room a lived-out appearance. 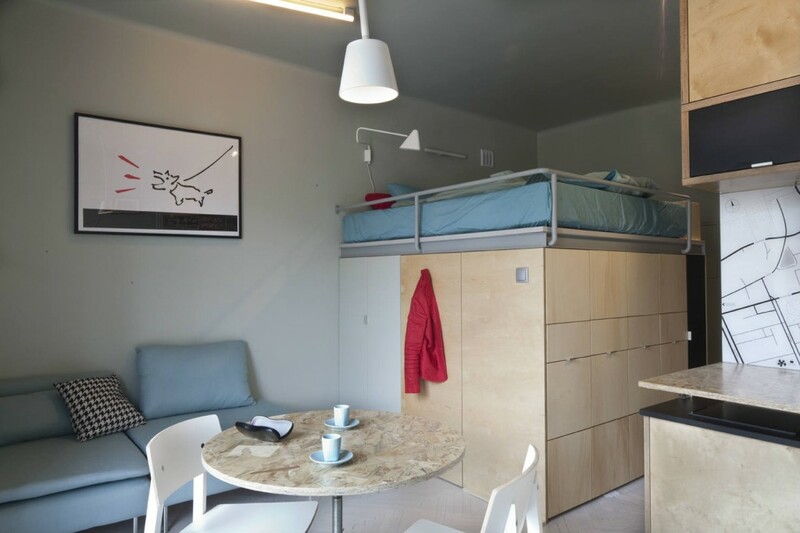 Bed-loft With sufficient ceiling heightA double loft bed is a harmonious sleeping area. Additional lighting and a beautiful view of the apartment make it especially cozy. On the door opposite the bed was a functional panel of the Big String Out! Firm OneOnes, made of elastic laces. With him, all the little things that are necessary in everyday life, will be at hand. The storage system has both a wardrobe part,And a lot of built-in boxes. Natural colors and simplicity of lines make it less bulky. To keep the solid array of storage system does not look boring, the door to the wardrobe is painted black. Practical kitchen The small kitchen has contained everythingNecessary for its use. Some tricks, such as a folding cutting surface, help to win additional functional area. 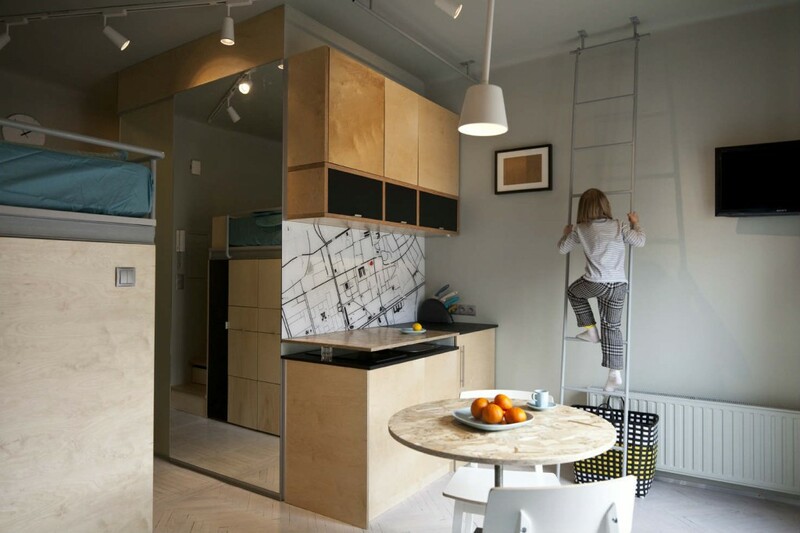 For spacious hanging cabinets is providedladder. 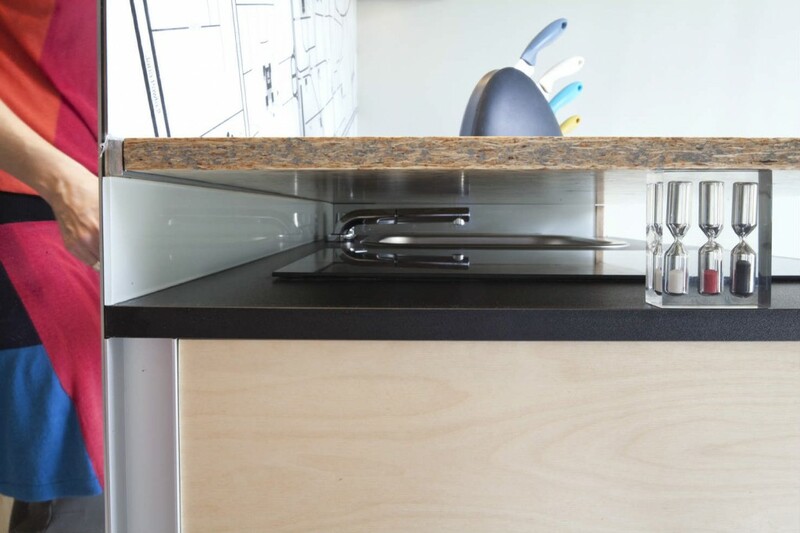 Thanks to the screw mechanism, the kitchen table is able to change its height from dining to coffee. Comfortable small living room A modern sofa and open shelves are sufficient for a small living room. It is laconic and not overloaded with details. 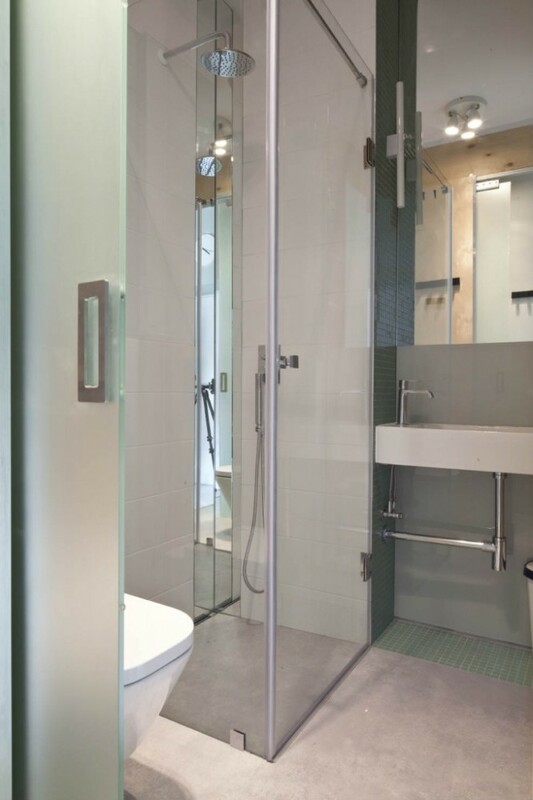 Functional shower room SpaciousThe shower corner is decorated with mirrors. 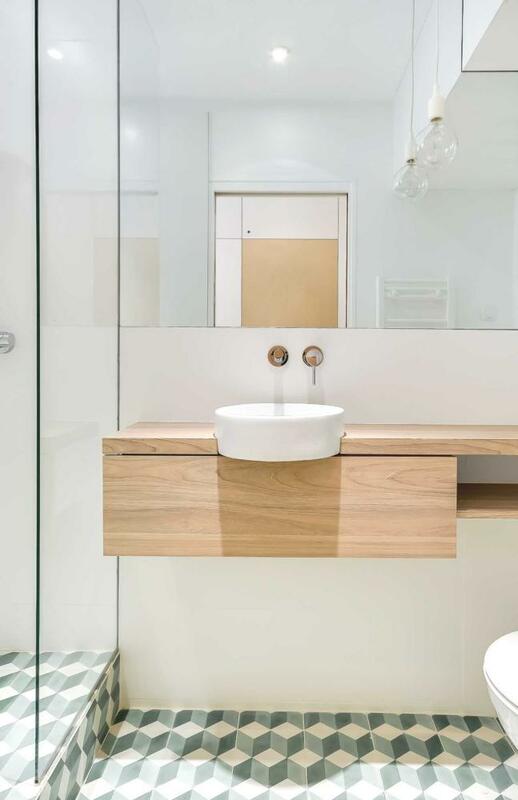 A suspended toilet bowl and an unusual shape of a compact rectangular washbasin saves space in the shower room. 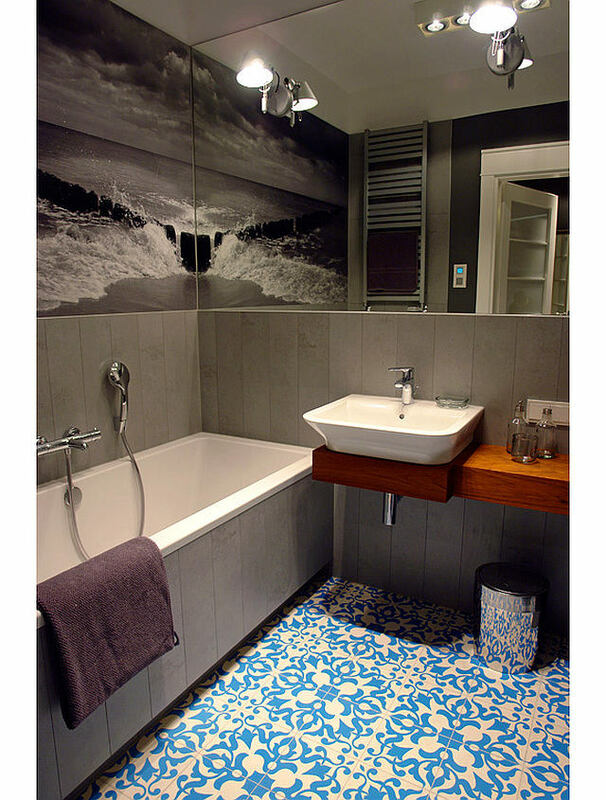 In the finish, concrete and tile of greenish shades are used.